Ad-Rock performing in Barcelona, 2007. This article is about the rapper. For the Futurama character, see Ad-Rock's head. Adam Keefe Horovitz, known on stage as Ad-Rock or King Ad-Rock, is an American rapper, guitarist, producer, and actor who provided the voice of his own head in a jar and Adam Yauch's in "Hell Is Other Robots". 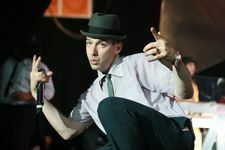 He is a long-time member of the rap trio the Beastie Boys, but began his career in the punk rock scene before joining Michael Diamond ("Mike D") and Adam Yauch ("MCA") in the then-punk-rock-oriented Beastie Boys. He has also had a minor career as an actor appearing in films and TV series, and as a producer and remix artist under the alias "41 Small Stars". During production of "Hell Is Other Robots", David X. Cohen and Ken Keeler traveled to New York to record the Beastie Boys for the episode but were unable to get their parts recorded. Ad-Rock and Mike D later recorded their parts separately after David and Ken had returned to Los Angeles. This page was last edited on 31 October 2013, at 09:31.